* The information in the brackets are my changes. Heat olive oil in a large skillet over medium-high heat. Cooking in batches if necessary, add garlic and Swiss Chard; cook for 1-2 minutes until just wilted. Season with a pinch of salt and transfer to a colander to drain excess water. Cool to room temperature. Combine shredded mozzarella cheese, mayonnaise, cream cheese, Parmesan cheese, oregano, cayenne pepper, and black pepper in the bowl of a food processor and pulse until thoroughly combined. 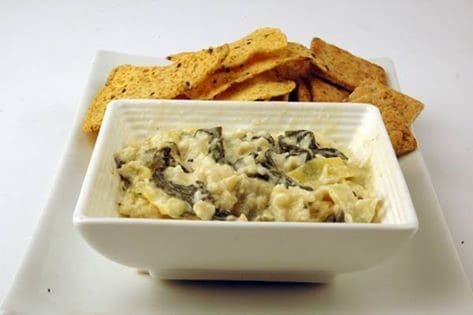 Using a spatula, scrape cheese mixture into a large mixing bowl, and stir in cooked Swiss Chard and artichoke hearts. Transfer dip into a shallow oven-proof dish and place dish onto a baking tray. Heat in oven for 15 minutes until hot and bubbling. Serve with baked tortilla chips, crackers, and vegetable crudités for dipping.